Animonda GranCarno Exotic is a healthy and tasty wet food for adult dogs. The wet food contains real pieces of fresh buffalo, ostrich or kangaroo meat. A real treat for your pet! 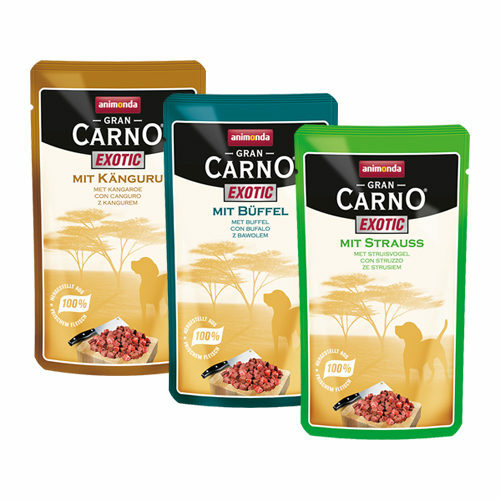 GranCarno Exotic from Animonda is a healthy and tasty wet food with real pieces of buffalo, ostrich or kangaroo meat, specially for your adult dog. The healthy food consists of 100% fresh ingredients and provides your dog with all of the nutrients it needs. The wet food does not contain grains or soy. Animonda GranCarno Exotic - Buffalo: meat and animal derivatives (56% beef, 11% buffalo) and minerals. Animonda GranCarno Exotic - Kangaroo: meat and animal derivatives (58% beef, 15% kangaroo) and minerals. Animonda GranCarno Exotic - Ostrich: meat and animal derivatives (58% beef, 15% ostrich) and minerals. Have you used Animonda GranCarno Exotic before? Let us know what you think about this product.